Since its creation in 1666, the Académie des sciences is committed to the development of sciences and advises the government in those matters. Independent and perennial, under the protection of the President of the French Republic, it is one of the five academies that are part of the Institut de France. In the early 2000s the Académie adopted a new set of statutes with the gain of increasing and rejuvenating its members in order to answer to the growth of scientific knowledge and to provide for a wider scope of scientific fields. Today with 259 Members, 130 Foreign Associates Members and 95 Corresponding members, elected among the most distinguished French and Foreign scientists, the Académie is multidisciplinary and widely represented on the international stage. Its members accomplish their works within thematic reflection committees in close interaction with the instances of statutory governance. The Académie fulfils five fundamental missions: encouraging the scientific life, promoting the teaching of science, conveying knowledge, fostering international collaboration and ensuring a dual role of expertise and advice. Essentially a society of scholars, the “Académie des Inscriptions et Belles-Lettres” brings its members together because of their common interest in research in the humanities. It was founded in 1663 on an initiative by Colbert. Since 1805 it has been housed in the splendid building that was the former site of the “Collège des Quatre-Nations”, built by Mazarin on the “quai de Conti”. It constitutes one of the five Academies of the Institute of France. The Academy represents a very long tradition of scholarship whose international influence has inspired invaluable support. It plays an essential role in the advancement of historical, archaeological, and philological scholarship. According to its charter, the Academy “is primarily concerned with the study of the monuments, the documents, the languages, and the cultures of the civilizations of antiquity, the Middle Ages, and the classical period, as well as those of non-European civilizations.” The active involvement of the Academy as well as that of its individual members in the progress of the humanities through the study of everything that is related to human activity and creativity, places it in a privileged position within the current academic community. The Academy, as set forth in its charter, plays an important role in fostering scholarship, both through the awards it bestows, as well as through the presentation of scholarly papers during its meetings. During these meetings, scholarship and discoveries of international and national importance are presented and discussed. The Academy is also distinguished by its constant publishing activities that render it one of the great sources of French scholarly publication. As a national authority, it also serves as the guardian and evaluator of various important French institutions. It is also considered as an expert to be consulted by government authorities on questions within its domain. 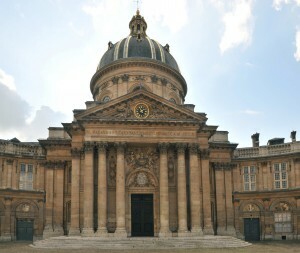 Thus, one can justifiably consider the “Académie des Inscriptions et Belles-Lettres” both as a “conservatory” (a place where human memory is “saved” and kept alive) and as a “laboratory” (a place that is alive and flourishing where research on human societies and cultures is taking place).